Int J Cancer 2014 135(2), 282-94. BAY 11-7082 purchased from Selleck. The inhibition of IκBα phosphorylation by BAY11-7082 (10 µM) was confirmed using western blotting, and GAPDH was used as an internal reference. Cancer Lett, 2016, 378(2):131-41. BAY 11-7082 purchased from Selleck. The effect of vaspin on TNF α -induced THP-1 cell adhesion to HAECS measured staining with VibrantDiO® Cell-Labeling Solution. The level of THP-1 cell adhesion to HAECs was measured at 4 hr after treatment with 25 -100 ng/mL vaspin in the presence or absence of 10 ng/mL TNF α . BAY11-7082 (10 uM, S2913, Selleckchem, USA), an inhibitor of NF- κ B, was used as a positive control. Cardiovasc Diabetol 2014 13, 41. BAY 11-7082 purchased from Selleck. J Neurochem, 2018, 144(6):780-790. BAY 11-7082 purchased from Selleck. Shown are Western blot analysis of Wnt5a expression in HDPCs treated with TNF-a (n=3–4). The gene expression level was normalized to GAPDH (n = 3–6). HDPCs were preincubated with pyrrolidinedithiocarbamic acid (PDTC, an NF-κB inhibitor), BAY11-7082 (an NF-κB inhibitor), SP600125 (a JNK inhibitor), SB203580 (a p38 inhibitor), or U0126 (an ERK inhibitor) before treatment with TNF-a. J Biol Chem 2014 289(30), 21028-21039. BAY 11-7082 purchased from Selleck. The irradiated Beas-2B cells were further co-cultured with U937 cells for 24 h after irradiation. In some experiments, Beas-2B cells were pretreated with 10 μM of U0126, SB203580, or necrostatin-1 for 1 h before irradiation, U937 cells were pretreated with 10 μM BAY 11-7082 1 h prior to cell co-culture, or 1 μg/ml anti-TNF-a antibody, 2 μg/ml anti-IL-8 antibody,40 nM SB225002 were added to the medium in the cell co-culture period. ***P < 0.001 compared with the non-irradiation control. #P < 0.05 ##P < 0.01 compared with cor-responding -irradiated cells. Mutation Research, 2016, 789:1-8. BAY 11-7082 purchased from Selleck. Reverse transcription-quantitative polymerase chain reaction assays revealed the effect of atorvastatin on visfatin-induced inflammation. Human coronary artery endothelial cells were incubated in the absence or presence of 50 ng/ml visfatin, with or without 50 nM FK866, 50 µM BAY11-0782 or 10 µM atorvastatin, for 24 h. (A) Atorvastatin downregulated visfatin-induced IL-6 gene expression (P-values from left to right vs. control: 0.0081, 0.0045, 0.0233 and 0.0057). (B) Atorvastatin decreased visfatin-induced IL-8 gene expression (P-values from left to right vs. control: 0.0096, 0.0037, 0.0043 and 0.0031). (C) Atorvastatin downregulated visfatin-induced IL-6 release (P-values from left to right vs. control: 0.0078, 0.0022, 0.0783 and 0.0382). (D) Atorvastatin inhibited visfatin-induced IL-8 release (P-values from left to right vs. control: 0.0094, 0.0032, 0.0039 and 0.0035). Significant differences were determined using Student's t-test; *P<0.05, **P<0.01 vs. visfatin control. 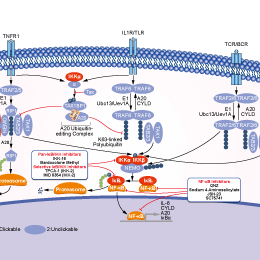 IL-6, interleukin-6; IL-8, interleukin-8. Oncol Lett, 2016, 12(2):1438-1444. BAY 11-7082 purchased from Selleck. Method: Cells are transfected with siRNA in 96-well microtiter plates and then cultured for 72 hours in complete NSCLC medium, treated with BAY 11-7082 for 12 hours. Cells are incubated with [3H]thymidine for 3 hours. The cells are collected on filters using an automatic cell harvester and radioactivity on the filters is measured by β-scintillation counting. Melisi D, et al. Expert Opin Ther Targets, 2007, 11(2), 133-144. Gastonguay A, et al. Cancer Biol Ther, 2012, 13(8), 647-656. Miwatashi S, et al. J Med Chem, 2005, 48(19), 5966-5979. Mori N, et al. Blood, 2002, 100(5), 1828-1834. Goffi F, et al. Neurosci Lett, 2005, 377(3), 147-151. Strickson S, et al. Biochem J. 2013, 451(3), 427-437. IKK-16 (IKK Inhibitor VII) : Pan-IKK inhibitor, IKK-2, IC50=40 nM; IKK-1, IC50=200 nM. TPCA-1 : IKK-2, IC50=17.9 nM. Bardoxolone Methyl New : Phase III for Chronic Kidney Disease and Type 2 Diabetes. 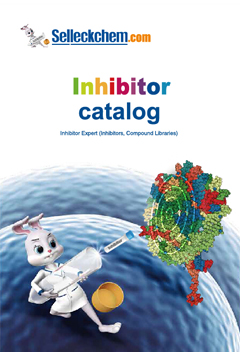 Bay 11-7085 New : Irreversible inhibitor of TNFα-induced IκBα phosphorylation with IC50 of 10 μM. Features:The only IKKβ inhibitor in clinical use for solid tumors, type 2 diabetes, and chronic kidney disease. An orally-available antioxidant inflammation modulator.